The Cloud Pillow features a unique triple layer design. The surface white layer is made of conforming memory foam which molds to fit your head and neck for unmatched softness and comfort. The ribbed surface allows air to circulate while quickly adjusting to your body temperature. The middle yellow wedge ensures proper neck support, while the blue base layer prevents the pillow from flattening. A crescent shaped cutout accommodates the shoulder area, allowing the head to nestle in the center of the pillow for optimum support and comfort. Ideal for back and side sleepers. Ordinary pillows don't properly support your head and neck. This forces your neck into unnatural, potentially harmful positions. Sleeping in an unsupported manner can cause the surrounding muscles in your neck and upper back to work harder which can result in a stiff, achy morning! 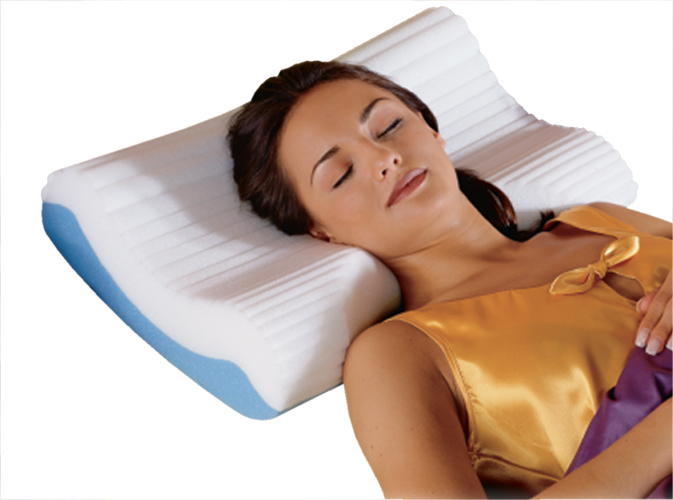 The Cloud Pillow helps support and align the neck and spine. Your head, neck, shoulders and back "sense" the support and relax so you enjoy a deep, restful night's sleep and awake feeling refreshed and rejuvenated. Your pillow comes with a custom fitted terry cloth pillow cover. It provides a soft sleep surface which compliments the pillow. Click the button below to add the Cloud Pillow to your wish list.